We just delivered the updated version of our IBM z Systems CPU Chart to our subscribers, with information about the capacity of the new z14 boxes from just about every perspective you could think of. Total MIPS, MIPS per engine, MIPS per MSU, High RNI MIPS, Low RNI MIPS, and over 35 other facts about each processor – you name it, and it is in there. The current chart contains data on over 1,730 processors, and is sent in both PDF and Excel format. If you are a Tuning Letter subscriber or BoxScore customer and you didn’t receive the latest CPU chart, please let us know at admin@watsonwalker.com. The new CPU chart will also be available soon on our www.watsonwalkerpublications.com site. Why would you pay for a CPU Chart of MIPS when IBM publishes them? If you take a look at an extract from our new CPU Chart at www.watsonwalker.com/CPUextract.pdf, you’ll understand how much additional information it provides. In addition to compiling information from ten IBM web pages, we provide additional calculations such as MP factors, hardware MSUs as compared to software MSUs, the Architectural Level Set, z/VM and Linux MIPS as compared to z/OS MIPS, MSUs in Power Save mode, speed of specialty processors, and differences between MIPS of Low-RNI/High-RNI/SP, and we explain the importance and use of each of these measurements. The ease of use of the spreadsheet lets you search any data item and sort on anything such as all sets of processors in a desired MSU or MIPS range. In addition to the chart itself, we provide 25 pages of explanation of such concepts as MSUs, MIPS, service units, and RNI. The more you use the Charts, the more you will wonder how you lived without them. Marna Walle always provides such valuable information, and her latest blog post doesn’t disappointment. She has some great links that you’ll want to keep. If z/OS 2.3 or z14 are on your shopping list, make sure to take a few minutes to review Marna’s blog. For the first time in over 20 years, Cheryl was unable to attend SHARE. As one of the attendees observed, “It just doesn’t seem right having a SHARE conference without Cheryl.” Someone else noted that he had never attended a SHARE where Cheryl was not present. She has a bad knee (which will be replaced next week), so after much begging, threatening, and bribing by Tom and me, Cheryl finally relented and agreed to give this one a miss. However, the new and improved Bionic Cheryl will be back at the next SHARE in Sacramento in March. I have already started saving up for my hoverboard so that I will be able to keep up with her. Even though Cheryl was not there in person, she watched the SHARE Live! sessions, and is a big fan. Whether you’re sending a person to SHARE or not, the $550 for almost 30 hours of sessions is an incredible bargain. There is a discount if someone from your company attends the conference, but there is no limit to the number of people who can watch the live feed or replay it. One of Cheryl’s many friends at SHARE told me that she received a text from Cheryl, saying that Cheryl loved her pink blouse – now if that isn’t the next best thing to actually being there, I don’t know what is! CMP – The Gift That Keeps Giving, But To Whom? A week after our Sarasota class on Software Pricing concluded and I had returned home to Poughkeepsie, Cheryl and Tom had to deal with the approach of Hurricane Irma. The Sarasota “office” is actually the 10th floor condo which is their home. So they took the last flight out of Tampa on September 9th and headed to Portland Maine where Cheryl gave the same class again on-site. As a result, they ended up having an “extended” vacation in sunny Portland (in Cheryl terminology, “extended vacation” means that she took a whole afternoon off!). In their absence, Sarasota started recovering from the hurricane. Friends who stayed in their condo said that the condo was spared without any power loss, and even Mikey the office cat, was hardly disturbed. 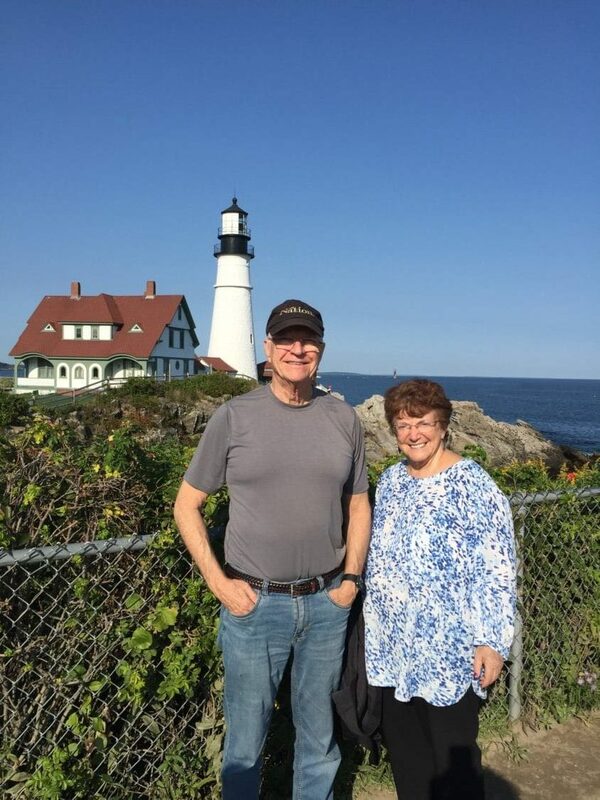 This photo of Tom and Cheryl was taken at Portland Headlight lighthouse.